First an earthquake in Ontario and Quebec, then a tornado touched down in Midland later in the week. I headed north to one of my favourite bike trails near Tiny Beaches and was happy to see very little damage along the trail. "Before becoming the center of the Western cultural universe, Manhattan was Mannahatta, 'Island of many hills,' in the language of 17th-century Native Americans. Using computer modeling, painstaking research and a lot of legwork, Wildlife Conservation Society ecologist Eric Sanderson has re-envisioned, block by block, the ecology of Manhattan as it was when Henry Hudson first sailed into the forested harbor in 1609." You've probably seen some great blendings of old and new photos, and I thought I'd give it a try. This one is of a Toronto Archives photo from May, 1923, and the Google Street View from the same corner. I resized the two photographs to match, then blended them using The Gimp. The streetcar tracks and houses on the north side of McCaul haven't changed too much, but the AGO on the south is rather new. As with many photos of Toronto, the telephone and hydro wires and poles bring the two images together nicely. 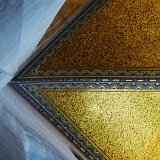 One of my favourite buildings in the city of Toronto is the Royal Ontario Museum (ROM for short), and my favourite space in the ROM is the 1933 rotunda with the spectacular gold and blue venetian glass domed ceiling. On this page I've collected some history and description of the room, some photos, even an audio tour from the ROM. It is a wonderful space, especially now that it can be enjoyed in relative peace, rather than as the cramped, busy, and loud main entrance to the museum. No visit to the ROM is complete without stopping in to the rotund for a moment or two. Dan Brown's latest book The Lost Symbol, is full of all sorts of references - religious, scientific, artistic, historical, architectural and on and on. If you're like me, you'll want to learn more about many of them, so I've started collecting maps, photos, videos, audio-clips, and other links to expand on some of the details in the book. I passed through the south end of the Mount Pleasant Cemetery and noticed that the outside work on the new Mount Pleasant Visitation Centre is pretty much complete. The visitation centre ( don't call it a funeral home ) has a long, protracted history reaching back to initial plans in 2004. It looks like they've done a nice job of the building and landscaping, and the running/walking/biking path is now open. Here are some photos from the end of September, 2009.